Washington Square Penthouses in Independence Place on the top (25th) floor rarely change owners. This professionally designed condo offers custom, built in cabinetry, high ceilings, a wood burning fireplace, 1980's balcony, hand-carved mahogany doors, floor to ceiling marble in the baths and a retractable wall for the bedroom. This condo has windows facing east. View the Delaware River, both Bridges, center city skyline, the USS New Jersey and all of Society Hill. Formerly a two bedroom, now set up as a one-bedroom unit, there is an alcove which can be made into another sleeping area. Two full bathrooms, the master featuring a deep whirlpool tub. Closets and cabinetry are maxed providing storage and double use of some spaces. 24/7 concierge and an underground parking lot with monthly fees, so you can have many parking spaces. Independence Place offers a bike storage room and community room if you need a larger space for entertaining. There is 15-20-minute parking in the front courtyard, making it convenient for your guests to meet you or dropping off some packages. This is a pet friendly building, allowing pets under 24 inches and some breed restrictions. 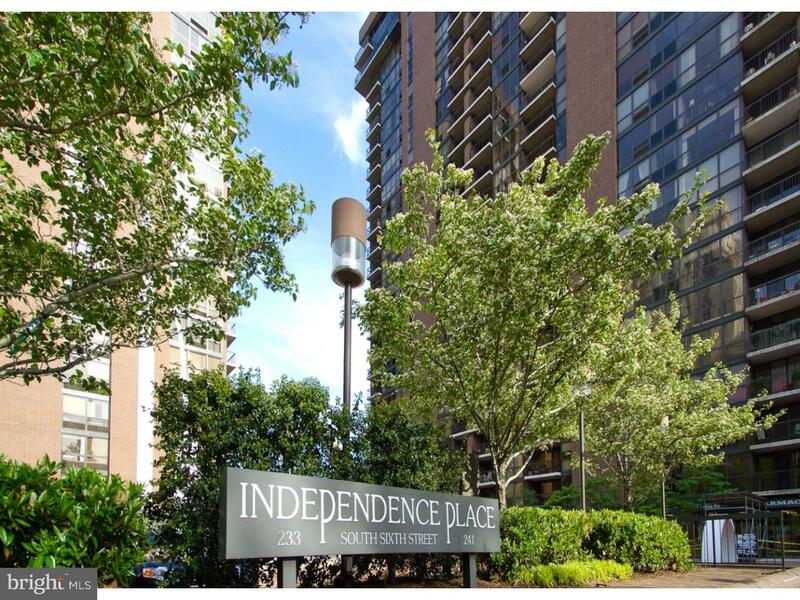 Living in Independence Place is known as Easy Living! Check OPA for 2019 taxes due to possible citywide reassessment.